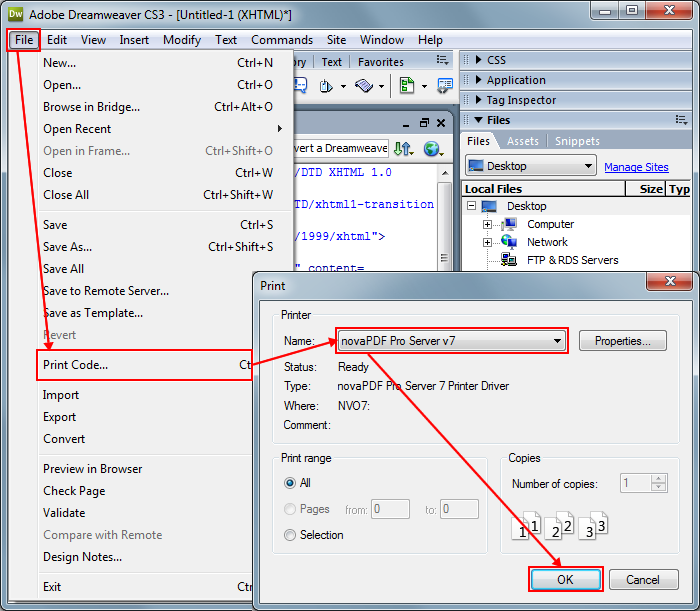 This article is about converting a Dreamweaver created file to a PDF document by using the novaPDF converter. If you do not have novaPDF installed on your computer yet, use our Download page for downloading and installing the application. Dreamweaver is a web development application currently maintained by Adobe. It was originally created by another company called Macromedia but after Adobe acquired them in 2005 the development has changed. The application can be used on Mac and Windows systems and includes multiple web technologies support like Java, CSS, frameworks like ASP, PHP, ColdFusion and languages for server scripting. It includes features like synchronization and transfer and like other development tools and editors, can upload anything it is created in its interface to a FTP, SFTP or WebDAV server. Language support is also strong, as it contains no more than 18 different languages to choose from. Some of the downfalls of this program however are the lack of support for previous versions, the fact that features may be removed in every release even if some users still need them, the help file which for new website developers is a very important tool is very hard to read because of the font and size used in building it etc. With Dreamweaver you can create pages with html, cfm, ASP, PHP, JS and XML content but for all these file formats you will always need a script editor installed on your computer to be able to further view and enhance them, either Dreamweaver or something else that does the same job. This is not the case with a PDF document as you can create one from virtually any other text or image file format that supports printing once opened in an application by using a PDF converter such as novaPDF. Also thanks to the ISO standard for portability and archiving, the PDF document is easier to share and save for later usage keeping the size as small as possible and the quality as high as possible. After setting up any after save actions in the Save PDF File As window click OK again and the PDF will be created.